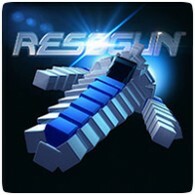 PS4 launch title and one of the first games in the Instant Game Collection, Resogun, has been confirmed to be “well under a gigabyte” by Finnish developer HouseMarque. The game runs at glorious 1080p resolution at 60fps and is pushing the boundaries of console games explains the developer. When it comes to antialiasing we are using FXAA. The lighting system is 100% deferred with HDR, SSAO, dynamic shadows and all the jazz with some screenspace reflections and dynamic color grading thrown in as well. We believe this is the first 60fps console game with all that. The game is said to have more objects whizzing around screen that the human eye can track, and there are also plans for DLC. The game uses around 50% of the PS4’s CPU power, and uses memory than PS3 has in total just for the flying cubes seen in the trailer above.